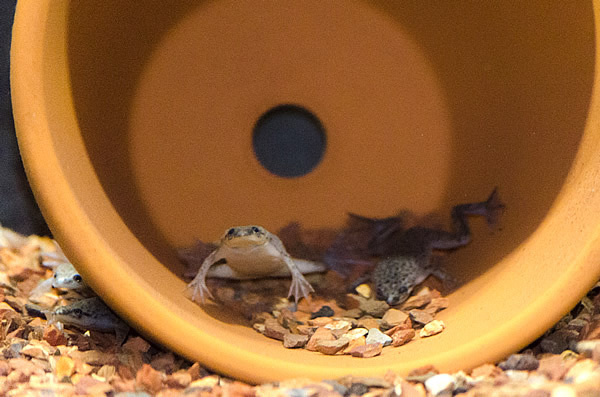 If you are new to the African dwarf frog hobby, you probably are overfeeding your frogs. Nearly all inexperienced keepers overfeed their frogs. I estimate that most beginning ADF keepers feed their frogs between four and ten times as much food as they should. They feed their frogs way too much food with every meal, and they feed their frogs way too often. Overfeeding is very bad for frogs. Just as is true for people, if you overfeed your frogs, they will get fat, and obesity will adversely affect their overall health and shorten their lives. Overfeeding will also foul the water in the tank because decaying, uneaten food releases ammonia and other harmful substances into the water. The main reason why most new keepers overfeed their frogs because they don't understand how the metabolism of cold-blooded animals affects their eating habits. Unlike warm-blooded animals like mammals (including people) and birds, cold-blooded animals don't need to constantly spend calories keeping their bodies at the right temperatures. When resting, they use very little energy, which enables them to go for a long time between meals. Not having to eat very often is a big survival advantage for animals who live in harsh environments where food may not always be available. In the case of prey animals like African dwarf frogs, being able to go a long time between meals has an additional survival advantage because in nature, emerging from their hiding places to find food may result in a frog's becoming food. The less often they have to emerge from hiding to find food, the less likely they are to be eaten by some bigger creature. The second reason why new keepers overfeed their frogs is because their frogs always seem to be hungry. That's because like most cold-blooded animals, African dwarf frogs are opportunistic feeders. In their native environments, food may not always be available; so when they do find food, they stuff themselves until they literally don't have room in their bellies to eat any more. Opportunistic feeding works out pretty well in nature where food is hard to come by, the frogs have to spend a lot of energy finding it, and it may be a few days before they eat again. In a tank with a keeper who feeds them whenever he or she thinks they must be hungry, not so much. The problem is that even in captivity, African dwarf frogs (and most other amphibians and reptiles) still eat as they would if they were in the wild. Whenever they see food, they eat it. It's a behavior that's hard-wired into them. They literally don't know when to stop eating. That's why their keepers have to know when to stop feeding. Given their own way, our frogs would literally eat themselves to death. Different keepers have different opinions about this question. Some keepers feed their frogs a little bit of food every day, but never enough to fill them up. Other keepers feed their frogs until they're full every other day or every third day. My system is to feed them until they're full on Mondays, Wednesdays, and Fridays, but to not feed them at all on Saturdays or Sundays. The reason I do it this way is because I believe that frogs are programmed by nature to eat until they're full, so I want to give the frogs in my care that opportunity. But in my experience, feeding ADFs until they're full every other day is a bit too often for their health. When I was doing it that way, my frogs started to get too chubby. Skipping the weekend feeding solved that problem. I know it's not very scientific, but it works for me, and my frogs haven't complained at all about it. It's also easy to remember. It's also important to remove uneaten food from the tank so it doesn't start to decompose and foul the water. Generally speaking, you can do this about ten to 20 minutes after feeding them. It doesn't take ADFs longer than that to eat enough to be full. Never leave uneaten food in the tank for more than 30 minutes, no matter whether the frogs are done eating or not. It starts to decompose by then at the temperature range a at which a frog tank should be maintained. Because I like to use a substrate in my habitats, it makes removing the food that sinks to the bottom harder to remove. That's why I also keep ghost shrimps in my frog habitats. The shrimps are better scavengers than the frogs are. They eat up any little bits of food that settle on the substrate and that vacuuming may miss. I call them my "janitorial crew." The shrimps digest the stray bits of food very thoroughly and have very low bioload, so they actually have a net positive effect on water quality. By eating the food before it starts to decompose, they prevent more ammonia from getting into the water than they themselves produce. Ghost shrimps are very inexpensive because they're sold primary as feeders for fish and aquatic reptiles. But because they're so inexpensive, some pet shops don't take care of them very well. If you want to use ghost shrimps in your frog tank, I suggest that you buy them from a pet shop that keeps them in the same tank as fish that they sell as pets (like neon tetras or zebra danios), not in a tank with fish that they sell as food (like rosy red minnows or comet goldfish). Also be aware that African dwarf frogs will eat ghost shrimp if they can catch them. Buying larger shrimp will help reduce the chances of their becoming frog food. As to how much to feed your frogs at every feeding, if you're using a two- or three-day feeding schedule, the answer is as much as they'll eat in about 10 to 20 minutes. I know, that's not a very precise answer. But you'll get the hang of it over time. Eventually there will be very little in the way of leftovers because you'll get better at judging how much to feed your frogs. If you're using a commercial aquatic frog food, then follow the instructions on the label. Most of them specify three or four pellets per frog, per meal. In nature, African dwarf frogs are omnivorous semi-scavengers, which basically means that they'll eat pretty much anything, dead or alive, that they can fit into their mouths. They especially enjoy eating live food, but there are very few creatures small enough for ADFs to eat alive. In captivity, African dwarf frogs should be also fed a variety of foods. A commercial aquatic frog food from a reputable manufacturer should be part of their diet. Commercial frog foods from reputable manufacturers are well-balanced and form the basis for a healthy, if rather boring diet. They shouldn't be all that you feed your frogs, but they should be on the menu. Personally, I feed my frogs pellets on Mondays (but only on Mondays) when they're especially hungry because they haven't been fed over the weekend. I do alternate the brands for variety's sake, but all my frogs get pellets on Mondays to help assure that they get all the vitamins, minerals, and other nutrients that they need. Live or frozen brine shrimp or mysis shrimp. Frozen (not live!) bloodworms. The live ones have hooks that can injure your frogs throats. Frozen beef heart (yes, it really is exactly what its name implies). Live or frozen Gammarus (also known as "scuds"). For beginners, I suggest that you buy one package each of frozen beef heart and frozen bloodworms for your frogs from a local pet shop. They're not very expensive, especially since our frogs require so little food. These foods come frozen in cubes that are sized so that one cube will feed three ADFs if they're on the feeding schedule that I use. If you need to cut the cubes, a knife that's been heated under hot tap water does the trick nicely. When you feed your frogs frozen foods, thaw them out first. The frogs will be more likely to eat them and will be better able to digest them if they are at the same temperature as the water. The easiest way to thaw them is to just plunk them in a Dixie cup of water that's about the same temperature as the water in the tank. All of the above foods are also available in freeze-dried versions. If you choose to use freeze-dried foods, you must rehydrate it first by putting it in water and letting it sit for a while until it's soft. If you don't rehydrate it, the food will be very difficult for your frogs to digest and will likely cause bloating. In nature and in captivity, African dwarf frogs are weakly nocturnal. They tend to be slightly more active at night, and that's when they usually do most of their foraging and feeding in the wild. If you wanted to simulate their wild environment as closely as possible, then feeding them at night (that is, as soon as the day light in their tank is turned off) would be part of that. The problem is that it's more difficult to gauge the amount of food your frogs eat and to remove uneaten food when the tank is darkened. Also, frogs are just barely nocturnal, so it really doesn't make that big a difference when they eat. They adapt to day feeding just fine. I suggest that new keepers feed their frogs during the day. Once you get familiar enough with their eating habits that you can measure out the amount of food they're going to eat without there being leftovers, then you can feed them at night if you like. Personally, I feed my frogs in the morning. In nature, ADFs are bottom feeders, so many people suggest feeding them by placing their food on the bottom of the tank using a turkey baster. Many keepers also suggest using a small terra cotta plate like the ones that go under flowerpots, and placing the food in the plate on the bottom of the tank so the frogs know where to find it. They don't see very well, so putting the food in the same place all the time helps them find it more easily. This is an excellent way to feed your frogs if your tank doesn't have much water movement. Personally, however, I don't use either of those methods anymore. The reason is that all of my aquatic tanks do have filtration and aeration, which means that there's always a bit of movement in the water. The movement isn't very strong, but it's strong enough that the food doesn't stay where I put it. Here's what I do instead. First of all, I no longer keep any other animals except ghost shrimps in my frog tanks. When frogs are kept in tanks with fish, the fish usually eat most of the food while it's still at the top of the tank. Very little of it makes it to the bottom, so the poor frogs go hungry. This doesn't happen with ghost shrimps because they're also bottom feeders. Secondly, I let the frogs know that it's time for dinner by gently tapping on the glass three times with my fingernail right before I feed them. Believe it or not, they learn very quickly that the tapping means to get ready because food is on the way. That's important because, as mentioned earlier, ADFs don't have very good vision. If you just drop the food in the tank, they may not find it before it starts to spoil. But when they know it's coming, they get excited and start looking for it right away. It only takes about two to four feedings before they figure it out. Here's a video of a feeding using this method. The above video was taken from inside the tank using an underwater camera. The frogs are eating a "carnivore mix" of bloodworms, mysis shrimp, and other tasty stuff that was thawed from frozen cubes.